Considerably smaller (L 48 cm) than other European Cormorants, has characteristically red head and neck. 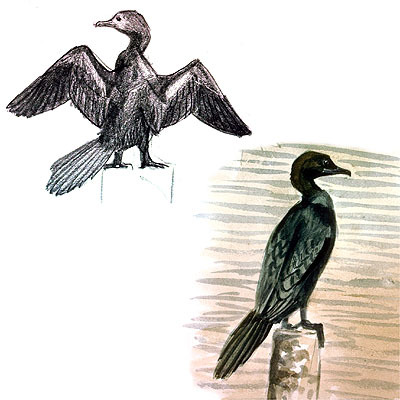 Pygmy Cormorants prefer wetlands , fresh or brackish, with abundant marshy vegetation. Feed mainly fish, caught by diving in shallow water. Migrant. The Greek breeding population is estimated about 400 pairs and appears to be stable. Direct persecution and loss and deterioration of feeding and breeding areas are the major threats to the species.